My other cat, Shoes, found out, and was really pissed. I promised her I’d write a blog about her too, so here it goes. Shoes named herself. I saw her little white markings on her feet and thought of �Socks� and Boots� but those were too trite. Then she climbed halfway in one of my shoes and mewed at me and I went. �Oh�Shoes, is it?� So she named herself, and had a way of acting like I was pretty stupid not to think of it before she had to show me. When I first brought her home, she wasn�t quite old enough to be declawed yet, and that�s usually not a big deal. But Shoes was another story. My best friend stayed over one night and whenever we�d close our eyes to go to sleep, she would see our eyes moving under our eyelids, and she�d rear up and then pounce on our eyes with both feet. It was so charming and comical, but not worth losing any eyeballs over. We had to buy swim goggles to sleep in, for our own safety. She pounced on them just to teach us a lesson. We didn�t get much sleep. But I can�t help but laugh. Cats are just so much fun. I like that they�re so independent. You can�t boss a cat around.Thus, I respect them. Other personality traits in Shoes include an unhealthy appetite for tape and other things that have glue on them. I bet she�d eat some paste if I bought her some. Glue-eating isn’t all that unusual. Kindergarten kids do it all the time. (though i never developed a taste for it, myself). Shoes also says “mama” to me�I actually made an effort to teach her to do this, so the first time she “said” it, I was a proud parent. Although it sounds more like “Meh-Meh� than “mama”, but I’m sure it’s some evolutionary constraint that she can’t help. She will aggravate me when she needs something and is relentless until I give in and follow her to wherever the issue is. It�s usually either the litterbox, the food bowl or the water. (ah, the simple life.) If it�s not one of those, it’s that she wants me to pay attention (“Look what I can do!”) Sometimes it’s that she wants me to sing to her. 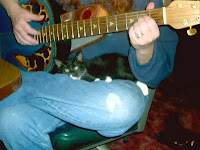 I did a lot of music when she was a kitten, and she is definitely a music lover. I�d catch her perched next to my studio mic, chirping into it, �MehMeh!� Pretty smart. One time she actually came and told me when Biscuit got her neck caught in the handle of a plastic sack (no doubt, due to her sack-licking obsession…a testimony to the dangers of addiction). Shoes came and screamed at me and led me upstairs, sitting down and waiting, until i understood, when Biscuit came flying through the living room, with a sack billowing out behind her like a parachute. (Now i cut the handles to all sacks). But if on occasion, calling to me doesn�t work, Shoes will start knocking things in the floor. Usually it�s not breakables. She seems fond of paper. 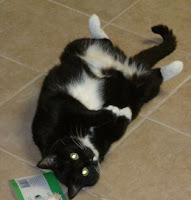 She�ll paddle at a piece of paper until she swipes it to the floor. And then when i reprimand her, she does what no other cat I’ve ever had does: she runs TOWARD me. Now, most cats, when you yell at them, run AWAY. Not Shoes. She trots over to me and asks me why I’m mad. She’s also not afraid of other people, nor thunderstorms. Sniff sniff. Mommy’s so proud. I just told her i wrote a blog about her too, and she said, “It’s about time.” and knocked my stapler in the floor. *Panniculus– a layer of tissue, esp. a subcutaneous layer of fat. "My friend stayed over and asked me to set the alarm. I never use an alarm, but I kindly offered to set the kitchen timer, but warned her she'd have to get up every hour to reset it."